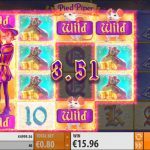 It seems that many games that come from Quickspin are based on popular fairy tales and legends, so is the case with Pied Piper video slot. The story takes us back to the German medieval village Hamelin and we can see the cobbled streets in the background. The sound effects have medieval vibe, and if you hear the pipe playing loud that means that Pied Piper will appear on the reels in the form of a walking wild. 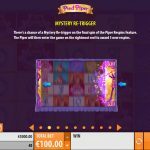 Pied Piper has couple of features that will make the game play more interesting and most importantly, more lucrative. The Piper wild can land fully on the reels, and when it does, the Piper Respins feature is activated where the Piper Wild and the Mouse Wild will walk on the reels. On the last spin it is possible to activate the Mystery retrigger. 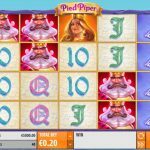 That means that the Piper will appear on the fifth reel and it will award 5 more free spins. The main feature is the free spins round. It is activated by landing 3 scatter symbols for which you will receive 10 free spins. During the feature 1 to 6 wilds will be added randomly to the reels on every spin. After every spin it is possible to land a Piper Wild which is an additional way to activate the respin feature. Pied Piper is one heck of a game and Quickspin has outdone itself this time. They have created this game in that way that it will be appealing to every kind of a player. The many features make the game play more interesting and you will be at the edge of your chair every time you activate one. We highly advise you to try this game out and see it for yourself. If you like slots based on famous fairy tales then you should consider playing Rapunzel’s Tower a 5 reels slot by Quickspin.